National Novel Writers Month! 50,000 words in 30 days! It's insane, it's crazy and it's fun! This is the 6th year that I have participated and the fourth year I have finished! It was grand and I sailed past the finish line about noon time today with almost 11 hours to spare. I got hung up around 40K. I was struggling with where the story should go and wondering if I had any more to say. But this year I had some last minute special help from my daughter-in-law (the author! yea!) with suggestions about fleshing out characters and working on back-story. And just in case you are the one person in the world that I haven't told, Tracy is going to have one of her books published. We are all so excited about it! And here it is! All the versions, revisions and notes, along with copies of theother four novels, lots of other things that I have written and a couple of gigs of pictures. I just had to show this to you. When your writing that novel becomes so precious that som of us have been know to have several backups. I'm a moderate, I only have two - and this is one of them. Can you believe how small this is? 4GB on something just a bit larger than a dime. Amazing! So what now! Well, I need to flesh out the ending, try for a second draft and see where that takes me. Will I ever submit it to a publisher? Maybe, or maybe not. But it's 50,000 more words than I had on October 31st. It was so much fun! I started with YA Science Fiction and ended up with a fun chick lit called Quilting Lessons. It's not quite finished and someday soon I hope I will finish the first draft and see what happens from there. And I have a half of a YA Sciene Fiction to finish, too. Thanks for all the encouragement! And thanks, Honey, for your help. 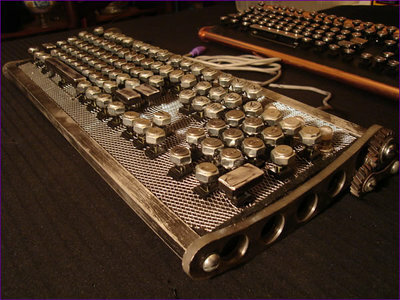 Steampunk or You won't believe these keyboards..
Do you know what steampunk is? I didn’t and I write it. Steampunk is a subgenre of fantasy fiction which is set in an era or world where steam power is still widely used—usually the 19th century, often set in Victorian era England—but with fictional technological inventions (like a computer) occurring at an earlier date or appearing through time travel. Think HG Wells and Jules Verne. In November of 2006, I wrote a novel (50,000 words of one but it might grow up and be a proper novel someday) about a woman who time travels back to Victorian England to solve the disappearance of her aunt. 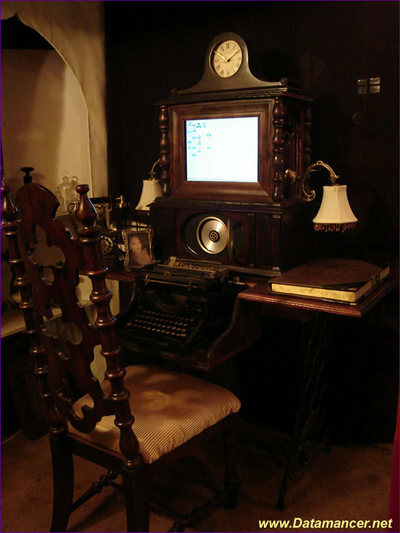 The aunt’s house just happens to have a computer and a butler—both of which seem to have beenaround for over a hundred years—both, albeit politely, run the place with the aid of some advanced technology. It was grand fun to write. And although I wish NaNoWriMo (National Novel Writing Month) would move from November to March when there seems to be more need of diversion…I recommend it to anyone who thinks they might have a novel in them. Back to Steampunk. Mixed media assemblage artist Michael deMeng, a favorite blog stop of mine, had the definition of steampunk and some pictures of steampunk computer keyboards on his site. It blew me away! So check these out and enjoy! Industrial keyboard from Richard R. Nagy better known as Datamancer. 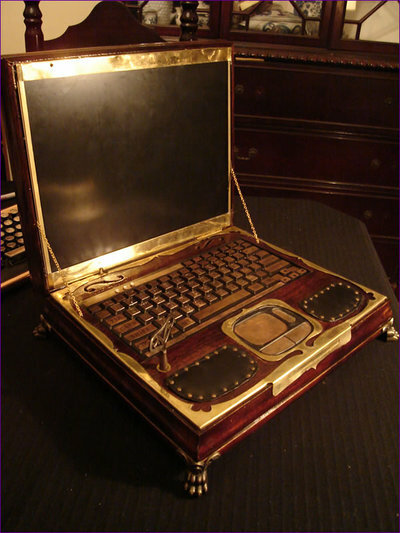 My next laptop. Love the key! ~a better look here~ This guy is amazing! So there you go. Check out his website and enjoy!